Hi friends! It’s one of the best times of the year…the Great Backyard Bird Count. It’s time to get ready to count some birds. The Great Backyard Bird Count (GBBC) occurs every February for four days. This year the count is this weekend, February 15-18. Created by the Cornell Lab of Ornithology and National Audubon Society, the GBBC was the first online citizen-science project to collect bird data in real time. In 2018, over 6,4000 bird species were recorded in over 100 countries in just four days! Create an eBird account if you don’t already have one. It’s free and only takes a minute to set up. Go outside for at least 15 minutes and count as many birds as you can identify. You can count anywhere as long as you want. Submit your results on eBird.com. Or use the mobile app to submit your data in real time. That’s it! By participating, you are helping scientists obtain data to help them track trends in bird populations before spring migration starts. Team BirdNation participates in the Great Backyard Bird Count every year, and 2019 is no exception. We’ll be bringing you updates on the birds we find throughout the weekend. Hope you can join in the fun! To find out more info, check out the Great Backyard Bird Count website, gbbc.birdcount.org. Author BirdNationPosted on February 13, 2019 February 13, 2019 Categories Birds, UncategorizedTags bird count, bird watching, Birds, citizen science, Cornell Lab of Ornithology, GBBC 2019, Great Backyard Bird Count, Great Backyard Bird Count 2019, National Audubon Society1 Comment on Time to Count! Yesterday, October 6th, was the first October Global Big Day. For the past 4 years, the Cornell Lab of Ornithology has held an annual Global Big Day event in May. 2018 is the first year that this Big Day event was also held in autumn. With spring now in the Southern Hemisphere and autumn in the Northern Hemisphere, the Lab thought it would be great time to track the migrations around the world. Dave and I went to Cape May for our big day. We hiked around our two favorite Cape May locations: Cape May Point State Park and South Cape May Meadows. It seemed like everyone had the same idea about going to the Point. It was packed with birders of all ages. Many people were participating in the fall Hawk Watch, which takes place daily during the migration. Located on a prime location of the Altantic Flyway, Cape May is one of the best birding areas in the country to catch a sight of migrants, whether they are hawks, warblers, or anything in between. Tree Swallow massive flock! : We had the opportunity to observe a large flock of Tree Swallows gathering on the beach. It was amazing to watch them swirl around over the sand. Tree Swallows migrate in huge flocks that can number in the hundreds of thousands. They take about 3-4 months to migrate from their summer to their wintering grounds, leisurely stopping en route to forage, preen, and rest. Sometimes the flocks are so large that they come up on weather radar as “roost rings”. Monarch Butterflies. It’s also migration time for the Monarch Butterfly. Cape May happens to be a fantastic place to experience their journey. We saw many as we walked the trails. Palm Warblers, Common Yellowthroats, and Yellow-rumped Warblers. Warblers are now migrating through the area to their wintering grounds. There were Yellow-rumped Warblers flitting through the trees, Common Yellowthroats skulking through the bushes, and Palm Warblers zooming across the path. During fall migration, warblers adopt more drab plumage as opposed to their bright spring breeding plumage. The Palm Warblers we saw were actually the Western subspecies. The Western Palms are more numerous on the Atlantic Coast during fall migration. Atlantic Ghost Crab: Atlantic Ghost Crabs can be found from Block Island, Rhode Island south to Brazil along the coast. They are primarily nocturnal, so it was a surprising but wonderful sight to see one running along the trail. Winter Waterfowl: The winter Waterfowl are already starting to arrive. We saw groups of Northern Shovelers and Gadwalls at the Meadows (as well as some Ruddy Ducks and American Wigeons at the Point). Common Buckeyes. We saw a few Common Buckeye butterflies fluttering around the paths. Overall, we saw 31 species for our October Big Day (60 species for the May Big Day at Forsythe NWR. It’s always a joy to go birding in Cape May, especially during fall migration. Tell us some of the migrants you’ve been seeing in your area in the comment section! The Cornell Lab of Ornithology/eBird released the results of last Saturday’s Global Big Day. This year’s big day set a record of 6,899 species in a single day. Over 28,000 people in 170 countries participated in the event. We had a great day birding at Edwin B. Forsythe NWR for Global Big Day. You can read about our day at BirdNation’s Global Big Day. Are you ready for Global Big Day? It’s Saturday, May 5th! What is Global Big Day? Global Big Day is an event created by the Cornell Lab of Ornithology. The goal is to see how many birds can be counted from all around the world in a single day. More than 150 countries participate in the count. In 2017, over 6,659 species were reported in one day. That’s 65% of the world’s bird species! This year is expected to be even bigger. Set up your free eBird account. It only takes a minute, and you’ll be able to record all your future sightings/trips once you are set up. 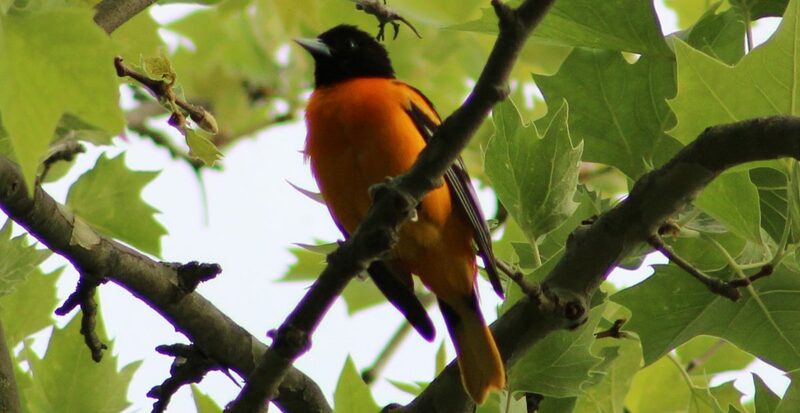 Go birding on May 5. It doesn’t matter how long you’re birding, just record as many species as you see/hear. Report your data and watch as the sightings roll in at the eBird website. Team BirdNation will definitely be out participating in Global Big Day. We plan on birding at Edwin B. Forsythe NWR. Have fun participating! Today, January 5, is National Bird Day! It’s a day to celebrate the lives of our avian friends and promote awareness of critical issues that birds face. In honor of this day, the Cornell Lab of Ornithology, National Audubon Society, Birdlife International, and National Geographic announced that 2018 is the Year of the Bird. 2018 is the centennial year of the Migratory Bird Treaty Act, the law that protects migratory birds of North America. The four conservation organization, plus another hundred or so participating groups, will be spreading awareness of avian issues to the public through multiple outlets all year. How can you get involved in the Year of the Bird? One of the goals of Year of the Bird is to educate that public that small, meaningful actions to help birds can make a huge difference. And don’t forget to spread the word to your friends and family in person and with the hashtag #birdyourworld on social media. Author BirdNationPosted on January 5, 2018 January 6, 2018 Categories Birds, conservation, UncategorizedTags bird conservation, Birdlife Internation, Birds, climate change, Cornell Lab of Ornithology, environment, Migratory Bird Treaty Act, National Audubon Society, National Geographic, nature, wildlife conservation, Year of the Bird 20182 Comments on Happy Bird Day! I will be taking the Cornell Lab of Ornithology’s Comprehensive course in Bird Biology! If you’ve been reading my blog for awhile, I’m sure you know that the Cornell Lab of Ornithology is one of my favorite places. It’s one of my main sources of avian information and we even took our 2016 vacation to Ithaca, NY specifically to go birding at the Lab (you can read about that here and here). As a Lab member, I’ve spent countless hours on their website reading articles, watching videos, taking webinars, and watching bird cams. So when I learned about their Bird Biology class, I knew I had to take it. My dream is to be a Conservation Biologist/Environmental Scientist/Ornithologist, which is why when I’m not at my non-science related full-time job, I’m taking night/summer classes as a biology major. But when I found out about the Lab’s course, I knew it would exactly what I needed to start moving forward with my goals. The Lab’s Bird Biology course is a university-level self-study course that anyone interesting in birds can take. The course was developed was by one of my favorite ornithologists, Dr. Kevin McGowan, as well as Dr. Sarah Wagner. (Side note: I took a webinar with Kevin McGowan a few winters ago: Odd Ducks and Wandering Waterfowl. If you’re interested in identification courses I recommend checking out his classes/webinars). The course consists of using the textbook (pictured above) and online resources, as well as multiple tests and quizzes for each chapter. Pretty much anything you would want to know about birds can be found in this course. Topics covered throughout the 700-page book include anatomy, evolution, migration, vocal behavior, social behavior, ecology of populations, and flight to name a few topics. I’m so excited to dive even further into the avian world and share some of the information I learn with you! If your interesting in learning about the Cornell Lab’s Bird Biology course check out their website.